LUXSURE Electronics Storage Bags, The Best Choice for Your Digital Equipment! √ SAFE, built-in double-layer foam layer, durable nylon fabric material, shockproof, scratch-proof and splash waterproof, provide comprehensive protection for your digital products. 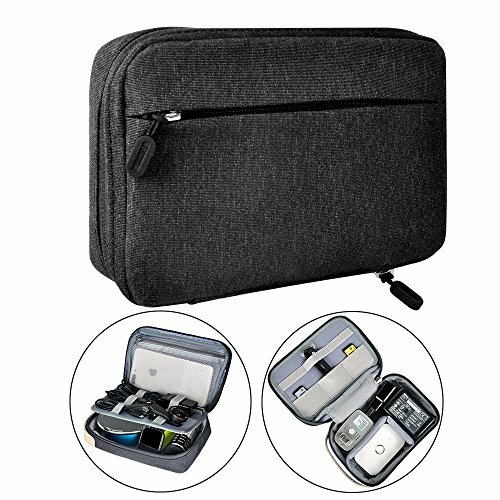 √ SUPER GREAT CAPACITY, deal with your hard drive, power bank, travel adapter, SD cards, earphones, cables, phone chargers in this one storage bag. √ COMPACT DESIGN, large storage grid with velcro dividers, mesh pocket, storage board with multiple elastic loops make it easy to organize your portable accessories. SPECIFICATION - Dimensions: 7.9"L x 5.7"W x 2.8"H. Weight: 0.35lb. It is suitable for storage phone charger, travel adapter, hard drives, cables, power bank and some bulky electronic equipments because of its thickness design. Choosing the size you need, keep your items in order. LARGE CAPACITY - This electronic organizer holds lots of items. There is a storage board which not only separates the main compartment from the grid but also has 8 or 10 elastic straps as well 3 or 4 SD card slots. Elastic straps hold cables and U disk well. Slots hold SD card or other small devices. Convenient to take it off and never worrying the scratches or scuff marks. CONSIDERATE DESIGN - The interior is equipped with foam for better protecting your electronics. There are self-assembled magic stickers (5 pcs). Different shapes of internal lattice cater for different devices that it is up to your needs. The front of organizer is equipped with a zipper pocket, which is designed for you to accommodate money, passport or mobile phone. ESSENTIAL for LIFE - Luxsure cable organizer combines the needs of people to create a demand which fits for the public. It is suitable for travel or household, sorting out the orderly display of your electronics. Perfect gift for friends and families. The package includes a electronic bag. We promise 24-month warranty and lifetime customer service.